Does analysis of the historic behaviour of stock markets around the time of the four-yearly Olympic Games have anything of interest for investors? The Olympic Games are a major event, often requiring much spending to improve infrastructure; and such spending can provide a fillip to a nation’s economy. If this affects prices on the stock market it is likely to happen soon after the initial announcement of a country winning the competition to host the event – so, long before the Olympics actually take place. The hosts for the Olympic Games are usually announced seven years in advance. 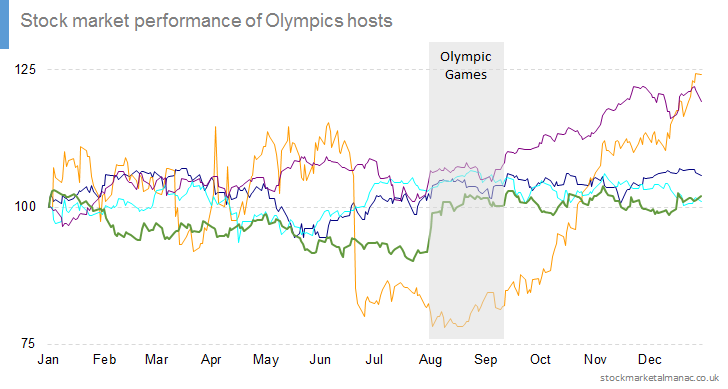 However, in this analysis we will look at the performance of host country stock markets in the year of the Olympics itself. The following chart shows the performance of stock markets in countries that have recently hosted the Olympics: US (1984, 1996), Australia (2000), Greece (2004), UK (2012). (NB. China was omitted as it hosted the Games in 2008 – a year when stock markets had their focus on other matters; the share price of National Bank of Greece was used as a proxy for the Greek stock market.). The index data has been re-based to start at 100. The Games generally take place in August-September (indicated by the shaded portion in the chart). There are no easily discernible general trends from the above chart. The darker bars show the average performance calculated excluding China and Greece. Generally, equities in host country markets appear to be weak in the months leading up to the games, perhaps when the media runs stories of cost overruns and missed timetables. And then there appears to be a relief rally afterwards. 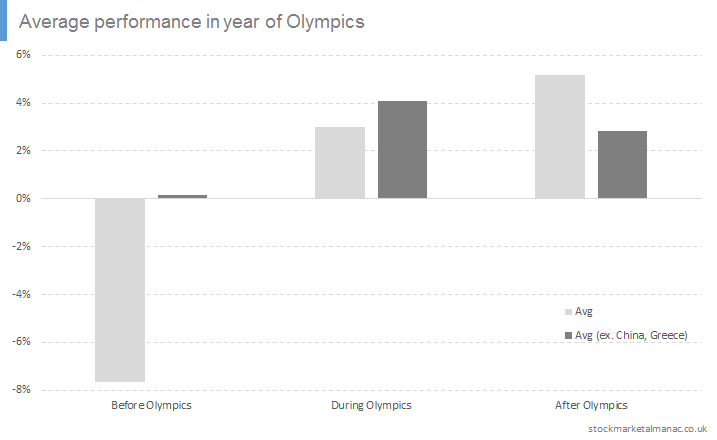 Olympic “euphoria” is sufficient in both China and the UK to influence stock returns and valuations but the overall fundamental benefits of the Olympics are small. 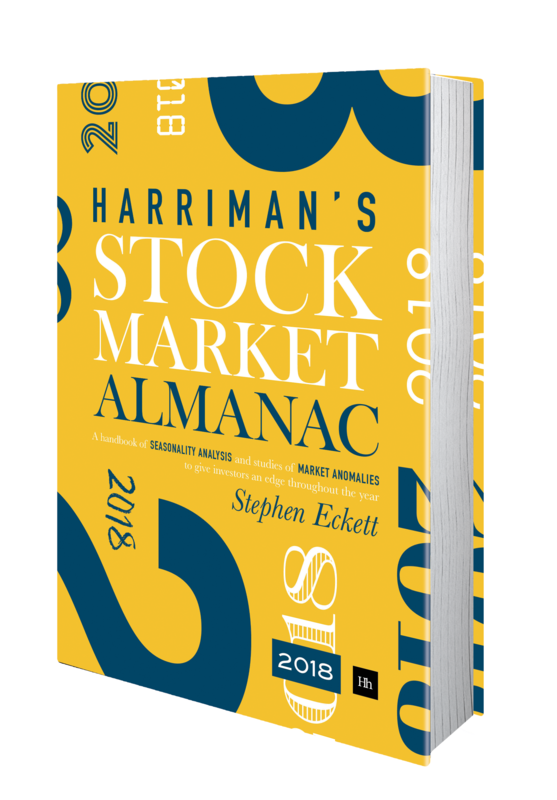 This article is an extract from The UK Stock Market Almanac 2016. This coming Sunday is Super Bowl XLVIII. One of the most famous market predictors in the U.S. is the Super Bowl Indicator. This holds that if the Super Bowl is won by a team from the old National Football League the stock market will end the year higher than it began, and if a team from the old American Football League wins then the market will end lower. Well, it certainly sounds far-fetched that a game of mutant rugby could affect the economy and stock market. However, in 1990 two academics published a paper (Krueger and Kennedy, 1990) finding that the indicator was accurate 91% of the time. And then in 2010 George Kester, a finance professor at Washington and Lee University, published a paper (Kester, 2010) with new research that found that the Super Bowl Indicator still worked (although its accuracy had fallen to 79%). Kester also calculated that a portfolio that switched between stocks and treasury bills governed by the Super Bowl Indicator would be worth twice that of a simple portfolio invested continuously in the S&P 500. And the connection between American football and the UK stock market is…? Seeing how closely correlated the U.S. and U.K. stock markets are, it might be interesting to see how the Super Bowl Indicator applies to the U.K. market. 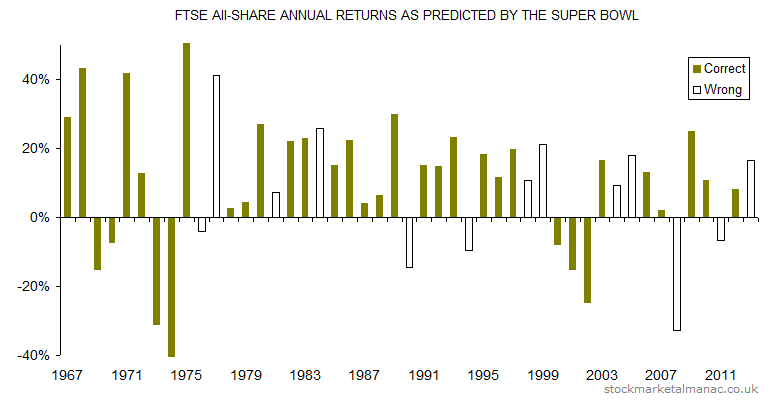 The following chart shows the annual returns of the FTSE All Share index since 1967 (when the Super Bowl started). The Y-axis has been capped at +/- 50%, which truncates the bars for the years 1974 (-55%) and 1975 (+136%). The years for which the Super Bowl Indicator failed to accurately predict the direction of the market has been indicated with white bars in the chart. As one can see, the indicator got off to a great start in the years following 1967, but recently its record has been patchy. Overall, the indicator was accurate in 72% of years (only slightly less than its accuracy rate in the US). Unfortunately a paper (Born and Acherqui, 2013) published last year has rather spoilt the fun. The authors found that the ability of the Super Bowl Indicator to forecast the market had reduced to almost zero in the years since publication of the Krueger and Kennedy paper in 1990. The chart below shows the market behavior around the time of the Super Bowl; the bars represent the average daily returns in the FTSE All Share Index since 1967 for the three days before, and three days following, the Super Bowl (which always takes place on a Sunday). 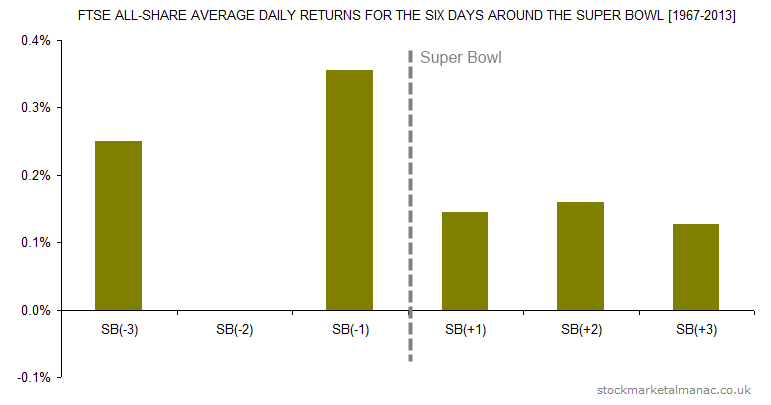 The average daily returns in the index for all days since 1967 was 0.03%; we can see therefore that the market is abnormally weak two days before a Super Bowl and abnormally strong one day before it.